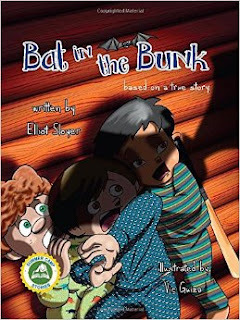 Elliot Sloyer’s “Bat in the Bunk” is a children’s picture book, based off the author’s experiences, that is sure to make readers think, laugh, and learn. This book, the second in the series, revolves around David and Elliot’s return to summer camp. They find a bat (the flying, mammalian variety, not the lifeless, wooden variety), which sets off an exciting series of events. The story is written so that beginning readers can handle it, yet the book is also great for adults to read to children. The plot is fun and unique and sure to keep youngsters engaged. I also like that the book touches upon a number of important themes, allowing children to explore these ideas and make decisions about them. The illustrations are well-done and complement the text well. A recommended read for anyone who wants a children’s book that is fun yet thought-provoking and sure to delight young readers.